Dhaka – Bangladeshi Prime Minister Sheikh Hasina has been honoured with Global Women’s Leadership Award 2018 for her contribution towards empowerment of the women in her South Asian country. 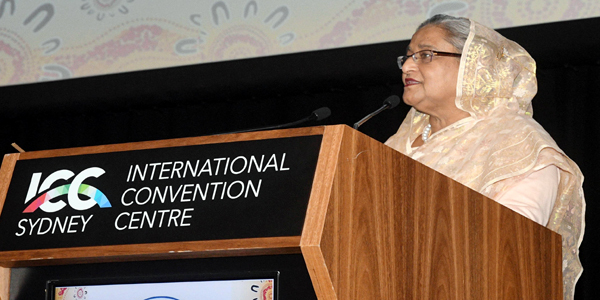 Receiving the award in Sydney, where she is attending the global women’s summit, Hasina on Friday called for a new alliance to promote women’s rights and empowerment. “We have to forge a new alliance to support the women and uphold their rights. Together, we must act on our shared culture, tradition and values to benefit millions of women in need,” Hasina was quoted to have saying by state-run Bangladesh Sangbad Sangstha. 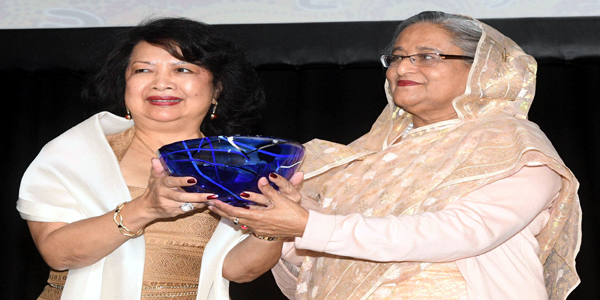 Global Summit of Women President Irene Natividad handed the award to Hasina amidst thunderous clapping of nearly 1500 women leaders who joined the summit from across the world. They also greeted the Bangladesh leader. The US-based Global Summit of Women conferred the award on Sheikh Hasina for her leadership in women’s education and entrepreneurship in Bangladesh. A video documentary on the political life of Hasina, Bangladesh’s economic progress and different steps taken by her government for women empowerment was screened earlier. In her reaction, Hasina said: “I am highly glad and deeply honored” to receive the Global Women Leadership Award 2018. She dedicated the award to the women across the world, who have shown their might in changing their life. “It is a great pleasure for me to see the women change-makers,” the premier said and extended sincere thanks to the Global Summit of Women for nominating her for the prestigious award. She urged all to work together to overcome traditional gender stereotypes regarding women’s ability and reach out marginal and vulnerable women who were still less fed, not schooled, under-paid and violated. Prime Minister’s younger sister Sheikh Rehana and Foreign Minister AH Mahmood Ali, among others, were present on the occasion.